It’s almost time to crack open that game again, can you hear the jungle drums beating? There isn’t one person at Boku Slots who hasn’t seen the movie Jumanji many times. Now, thanks to NetEnt we can relive the fun over and over again, and hopefully win a little something too. 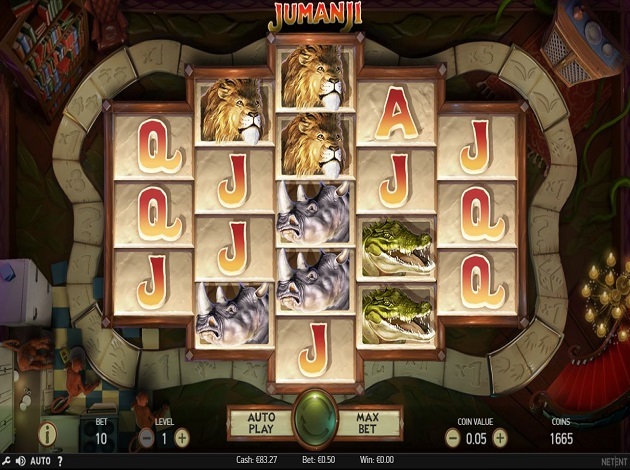 Jumanji is a 5-reel, 36 fixed pay line slot with a twist, because the reels are off set against each other in a format where the rows sit in the following formation: 3, 4, 5, 4, 3. The game offers an RTP of 96.3%, for all who dare to roll the dice. 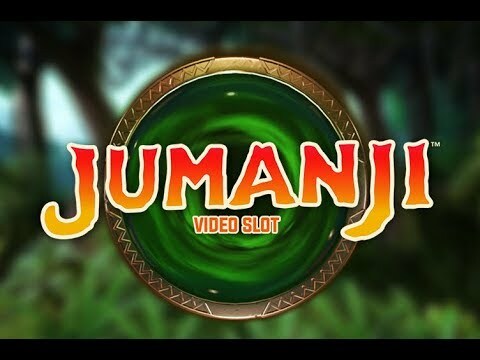 Jumanji gives a little video clip at the start of the game and the reels themselves are set out as if on the original Jumanji game board, which is a nice effect. Every so often you will see those mischievous monkeys move around or a dragonfly flutter across the screen, whilst in the background those dreadful drums keep beating along to the soundtrack. Bet Amounts – Betting begins at bet level 1 and at a coin value of 1p, making the spin cost just 20p each. It can be increased to bet level 10 and coin amount £2 making spins £200 per spin, so there is a lot of variance for bet amounts in between. Be sure you have correctly adjusted the bet level to the left of the screen and coin value to the right, before hitting spin. Wild Symbol – A golden Wild is of course your wild symbol, just in case you weren’t sure! It will substitute for all other symbols except the scatter. Unfortunately, within Jumanji the wild symbol has no extra value, but there are enough features here to forgive that oversight. Scatter Symbols – The Jumanji game box is your scatter symbol and landing 3 or more of these will take you into the bonus game. Once again there is no coin value attached to the scatter symbol, so no scatter wins here either. But worry not for there is still a lot that Jumanji has to offer by way of extras and features. Sticky Vines Feature – Land yourself between two and nine winning combinations on the reels, to trigger this feature. It is random, so you never know when it will activate, but when it does you will be very happy. Once triggered the vines will hold in place those symbols within the winning combinations, and the reels will respin. If more symbols are added to those already held in place to create a bigger win, then they too will then be held by the vines and the reels will respin again. This will continue until no new symbols are added to those held in place. All wins will then be accumulated and added to your balance, the vines will retreat, and you will be back to spinning the reels as usual. Monkey Mayhem Feature – Another randomly triggering feature in Jumanji is the monkey mayhem shuffle. At any point during the main game the reels or symbols will be moved around to guarantee you a winning combination. This only occurs as a singular feature unlike the sticky vines, but it can still be very helpful in creating wins. Wild Stampede Feature – Jumanji has a moment wherein stampeding animals cause havoc in the town, but here in the game its completely the opposite. Triggering at random you will see a herd of rhino’s trample across the reels and as they do they will add up to nine additional wild symbols. This can only be helpful in creating more wins and potentially big ones too, depending on what you already have on the reels when it is activated. Monsoon Wilds Feature – Not happy with just three randomly activated features, Jumanji has a fourth with the monsoon wilds. With this one you will see that one or two of the reels will turn completely wild, in a bid to contribute to more or bigger wins. 5 scatter symbols will award 8 rolls of the dice. Stampede Bonus Spins – receive 5 bonus spins with the addition of the wild stampede feature activated throughout the spins. If you land on the bonus spins squares, you will be taken to play those immediately and then returned to the bonus game once completed. The bonus game will continue until all your dice rolls have been used up, then any wins will be accumulated, and you will be returned to the base game. As you can see, despite no value being added to the wild or the scatter symbols, it really doesn’t matter. As once you get those reels spinning, you are looking at some profitable wins whether it’s from the random features or the Jumanji Bonus game. Although it seems complicated with all the different features, once you get playing it all falls into place. The wins come fairly often and with the random features, they can be bigger than usual. That being said, the bonus game took a little while to trigger but was fantastic when it did. We have to admit, we had a great time rolling the dice and watching our little figure move around the board. If anything, you will enjoy this game for what it is. Jumanji is forever in our hearts and now in the palms of our hands, so NetEnt we salute you for this.